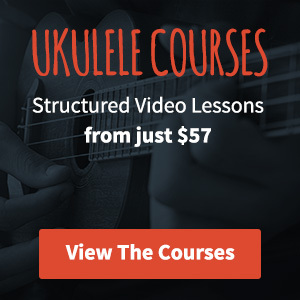 The ukulele lessons here have been put together to help you become a better ukulele player. There’s a good mix of songs and technique which cover anything from getting your strumming up to speed to introductions to fingerpicking and much more. Looking for something particular that you can’t find? Drop me an email and I’ll see if I can put something together for you. Campanella is a style of playing ukulele that attempts to get multiple notes ringing out at the same time – a little like bells. Campanella actually means ‘Little Bell’. In my last post about ukulele Fingerpicking for beginners we looked at using a simple 3 finger pattern to get you up and running. In this lesson we’re going crazy, we’re going to add a 4th finger to the mix. The ukulele is a great little instrument, but there are times when playing the chords exactly as they are written can get a bit, well… boring. There are hundreds of simple songs which have bar after bar of one chord, followed by lots of another, maybe a third, and then back to the first. Repeat for several verses, and it starts to cry out for a bit of variety. Learn to play the rather brilliant Lava on ukulele from Pixar’s 2014 short movie of the same name. It’s a beautiful song and really easy to learn. Read on for help with the strumming pattern, chords and song structure.